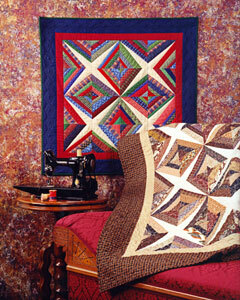 A progressive sampling of paper piecing. Blocks range from "easy" to "harder". Complete instructions. The little sampler is the ideal pattern to learn or teach paper piecing, but beginners and all levels will love it! It really looks great in 30's fabrics! 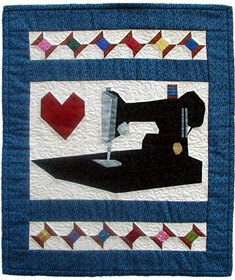 Stitch this little paper foundation pieced quilt honoring the Singer Featherweight 221. Complete instructions with illustrations. Includes a full size Master Copy of the machine block. 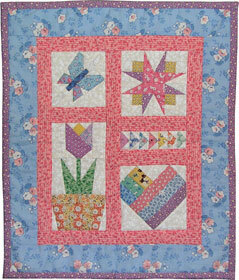 Wall Quilt: 32 1/2" x 32 1/2"
Lap Size: 50 1/2" x 62 1/2"
A quick, easy foundation string pieced quilt for scrap lovers and fabric collectors. This is a quick, easy, stress-free quilt. What makes Strip Mine! unique is that the star point background fabric is also the foundation -- just stitch & flip. A full size cardboard Marking guide is included with the pattern.